-20F!!! It doesn't even get that cold in my freezer which goes to a minimum of -18C (0F)! Elsa seems to be enjoying that bit of sun! We had a lovely day today at 32C (90F). Relatively cool for now, but heading towards 39C next Thursday. 32C! You wicked tease. Sounds lovely. It's less cold this morning, a roasting -8F at 9 am, so things seem to be warming up. It is very pretty and cheerful out: truly sunny today, with bright blue skies. Looks great from inside! I think it would truly look like a "winter wonderland" where you are with all the white, fluffy snow and blue sky. Does the snow sparkle in the sunlight? It sparkles in the sun, yes. But it's much more sparkly, enchanted-looking, under lamplight in the night. Just like fairy dust. A full moon makes it shimmer in a lovely but chilly way. Lamplight makes it sparkle like magic glitter. That description sounds gorgeous! The only time we get anything sparkly is if the sun comes out after a heavy shower. 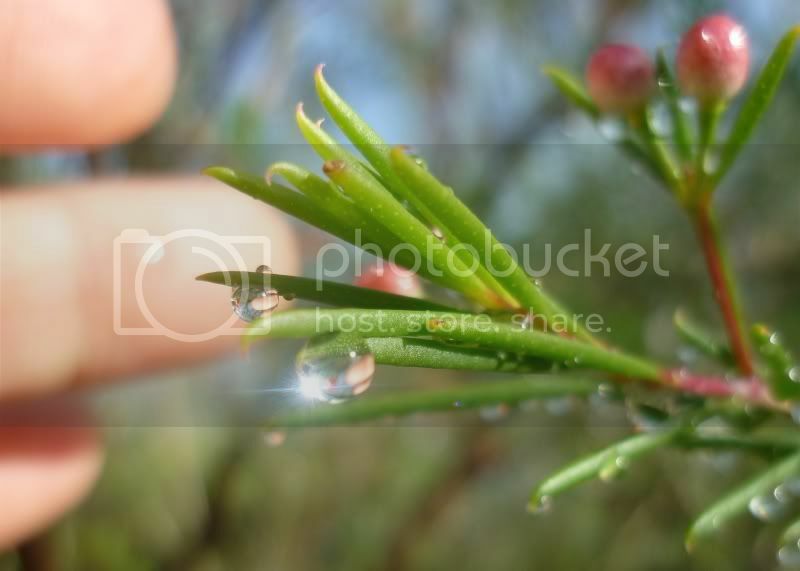 The raindrops hanging off the narrow leaves on the geraldton wax plant look like shimmering diamonds. I've tried very hard to photograph the effect, but I can only manage to catch one or two "sparkles"! I think it's practically impossible to capture the look of glitter in a still picture, whether on snow or rocks or rain-diamonds. I think the fullness of the effect is created by the act of the eye moving over the surface, especially if one is also moving, the light reflecting off one surface then another, multiplied by a thousand or hundreds of thousands or millions of little bits of surface in the case of sparkling snow or water. A rain-diamond might be possible, since dew drops are large enough to photograph up close, but I don't see how you'd get the effect of their sparkle since a still image can't capture the transition of the light as it moves through the drop. I meant to get back to you earlier, but here it is, Wednesday (Australia Day public holiday)! I believe you're right - the eye can to pick up so much more detail than the camera lens. The eye moves (as does your head) which multiplies the sparkle effect. The camera will focus on one spot; not the whole lot. I took this picture last May, managing to catch the "sparkle" of a raindrop - after many attempts! It would have been so much better to have a picture with the whole lot shimmering away! You did it! You captured a water sparkle in a still picture!! Go, Maewyn, Master Photographer! !